Stewart R: This week I shall lead with endings and then get onto the beginnings where this latest bunch of releases is concerned. This past year has been a fine time to be a reader of Marvel's off-centre, or 'fringe' mini and maxi series with the likes of She-Hulk and Elektra being examples I will recommend to friends (and anyone who will listen) for years to come. 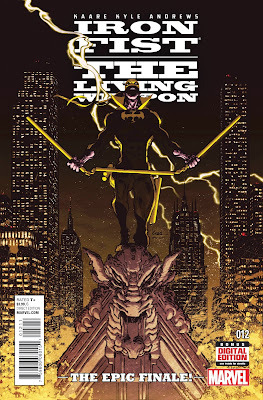 Kaare Andrews' Iron Fist: The Living Weapon will easily join those two in my future praises as a series that has introduced me to the life of Danny Rand, ripped the mythical land of K'un-Lun in twain and torn aside the veil of secrecy over this hero's supposedly steered path to the title of Iron Fist. It's been an emotional journey, scripted incredibly well by Andrews and depicted on the page with a unique visual flair which has delivered something breathtaking each and every month. 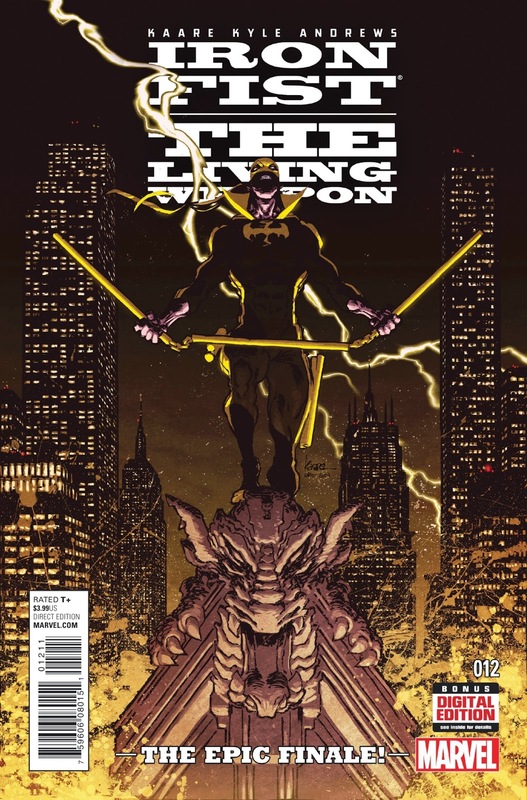 After 12 issues, I'll be sad to see this tale end. It'll be similar shame to witness the climax of Divinity from Valiant as they yet again seem to have hit the mark with a four-issue miniseries that has included their wider canon of heroes, yet has focused on a new character and his involvement in an alternate view of the Cold War space race. The true success of Matt Kindt's story has been that there have been no good/bad lines drawn here, just different perspectives of a journey and an Earth-based encounter/incident which is nearly impossible to predict the outcome of as we reach this finale. Finally there is one new book which I'll be investing in this week and yes, somewhat inevitably, it is a Secret Wars tie-in. Unlike the other gambles I've taken, however, I feel that Charles Soule scribing Inhumans: Attilan Rising is a likely success in the making as his work with the terrigen-enhanced populace has been terrific so far and I can't see problems in him negotiating the current period of flux in the Marvel Universe with anything other than aplomb. Kenny J: Looking back, 1999 was a formative year for me. Not only was it the year that saw The Matrix released in cinemas but also a little film called Fight Club. This in turn introduced me to the novels of Chuck Palahniuk at the same time as my comics reading was growing. Now, some sixteen years later, I am getting a sequel of the former in the form of the latter. I couldn’t be happier as Palahniuk himself picks up, presumably, where his original book left off. As a bonus he’s enlisted one of my favourite artists, Cameron Stewart, on pencils and Dave Stewart on colours. Just call me Jack’s whetted appetite. I recently heard someone state, rather slanderously, that Hawkeye was no one’s favourite Avenger. Obviously this person isn't reading Jeff Lemire's current stint on All-New Hawkeye as he continues to explore Clint Barton's childhood and his relationship with his brother. Along with his recent appearance in Avengers: Age of Ultron, Hawkeye is shooting towards the top of my list. As it is a light week for me I’ll be taking a look at one of those Secret Wars tie-ins. Namely Inferno, Marvel’s revisit to their '80s crossover as part of their current one. I’m a sucker for that decade’s X-continuity so this will definitely be making its way home with me.